Today was the Aoi matsuri, the hollyhock festival that takes place at the Imperial Palace, Shimogamo Shrine and Kamigamo Shrine. When I came to Japan two years ago, this was the first festival I went to, and I have written about it then at length. Today, I had the opportunity – thanks to a friend – to see the parade again, this time from the special seats in Shimogamo Shrine. 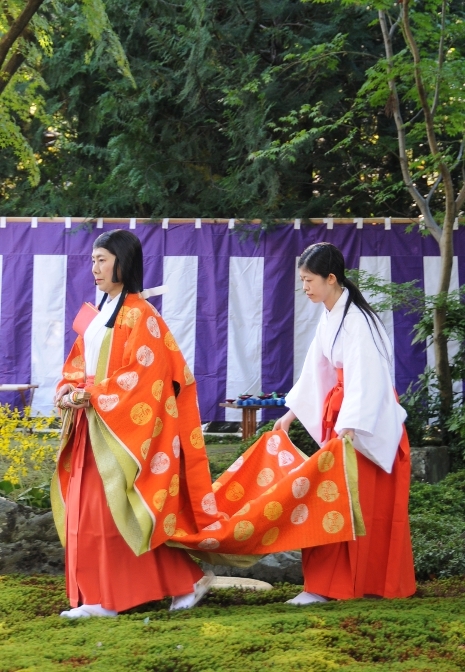 It was just as I remembered, almost a deja-vu, but now the beautifully dressed men and gorgeous women on foot or on horses were passing underneath the large trees of Shimogamo Shrine instead of the open space of the Palace, which gave the parade a whole different feeling. I also think that it was a bit more compact than the first time I saw it – whether this was due to the different location or because of different timing, I cannot tell. The weather was nice and warm, but not really sunny, so I still have to wait for my first sunburn this year. After the parade had passed the long sandy road up to the main buildings of Shimogamo Shrine, my friend and I had lunch at the few food stalls that were permitted at the shrine. We had yakisoba – grilled noodles with bacon and cabbage – and as dessert kasutera – a sort of small sweet buns made of pancake batter – and ichigo daifuku – sweet rice cakes with a strawberry on top. This year, I did not stay for the horse race as I had promised another friend to see her, but it was nice to go to the Aoi festival again. There is still a part I have not seen yet, the one from Shimogamo to Kamogamo Shrine, so there is something left to explore for next year. I am already looking forward to it! 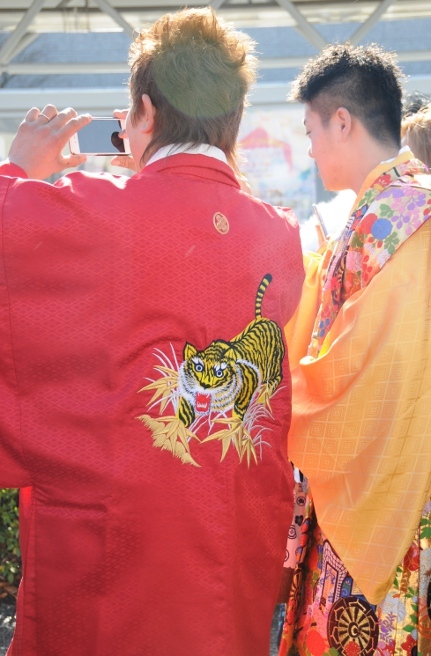 I went to Heian shrine again today in the hope of taking some pictures, but either I arrived too late, or the place to be this year was somewhere else than last year. In any case, there was a large group of young people in front of Kyoto Exhibition Hall, where some group had organised a meeting with speeches and photographers… so I did get some photos after all. Two things surprised me: First, the number of young people who were smoking. It is quite rare to see a Japanese person of any age smoking in public or on the streets. 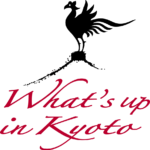 Especially in Kyoto, many tourist areas are strict non smoking zones, probably because so much of these parts of Kyoto are still made of wood, or maybe just because smoking in crowded places is not a very brilliant idea. There were even non smoking signs where the crowd gathered, but the brand new adults defied the signs as well as the guards and the police, who did not bother to say anything to begin with. I guess that they did not want to spoil the fun the youngsters had on their great day. Second, the guys surprised me again, just like last year. The normal, traditional formal wear for a man has two colours: black and white, and maybe some gray in between. 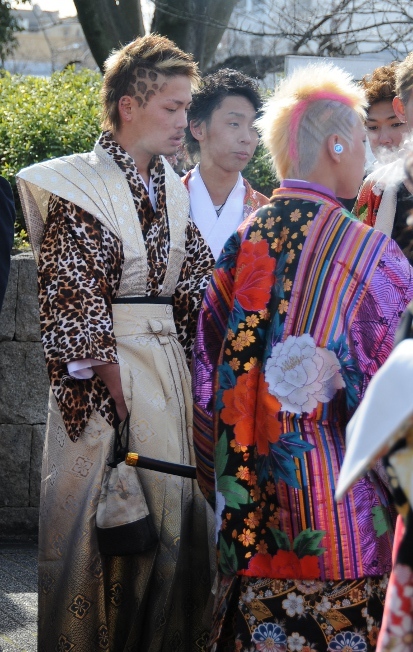 On seijin no hi, however, their kimono and hakama are often more colourful than the girls, and the young men don’t even shy away from dyeing their hair. I guess it’s the one and only and last day when they can be as reckless and irresponsible as possible in public. Obviously they had great fun doing so! I have written a little about Japanese New Year’s Traditions last year, and I bet I will be writing on this subject more often 😉 Again, I will focus on the things I have done myself this year. There are many Buddhist sects, but there is that one tradition for everybody, which teaches that anyone can be saved and go to heaven after death who is sincerely calling upon the name of the Buddha. Namu Amida Butsu literally means Homage to Infinite Light, but it can have other ideas behind it depending on the sect. In Japan, Butsu is the Japanese version of Buddha and Amida means as much as merciful. While they were having the ceremony, people wandered in and out, praying together with the monks or alone, while all through the bell kept ringing outside. 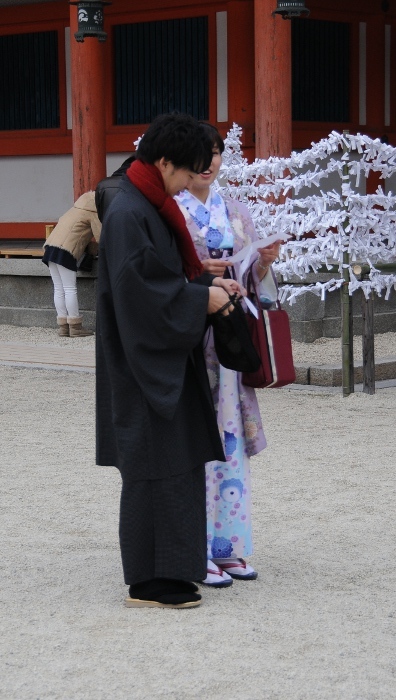 As I had no idea how long the ceremony would take, and it was cold in the temple (although it was a bit warmer than last year), I left after a while and went down to Okazaki shrine for my Hatsumode. Hatsumode is the very first shrine visit in the year, and people pray there and buy Omikuji fortune-telling slips or Omamori charms. 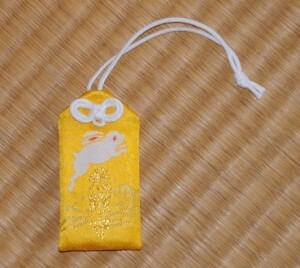 There are many different charms for all sort of things available, and this year I bought one myself: a general happiness-increasing charm in bright yellow. 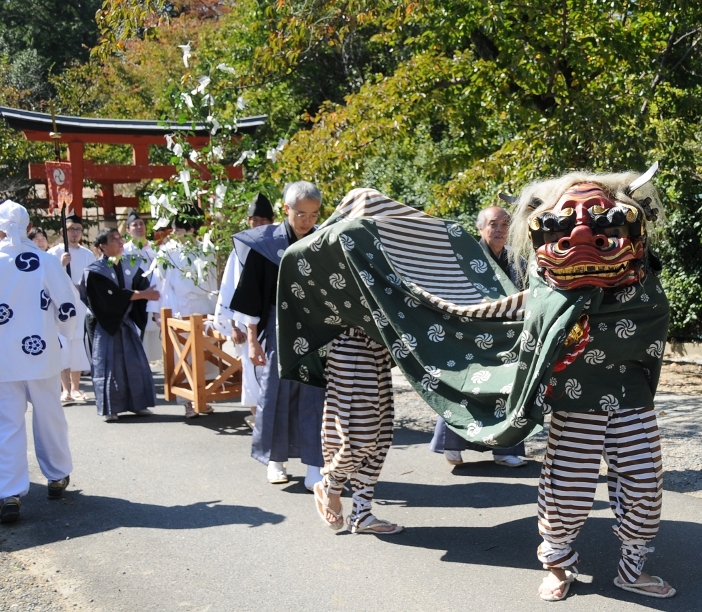 Last Monday, suitable for the Culture Day, there was a traditional event that goes back about 1000 years, centred on one of Japan’s favourite pastimes taking place in Jonangu shrine which is equally old and lies in southern Kyoto. 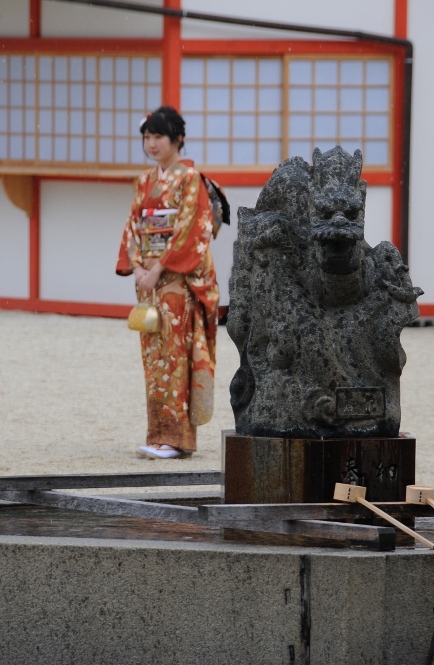 The event is called kyokusui-no-en and it is a kind of poetry game or competition involving multiple poets, a little stream, and enormous amounts of sake. The idea is as follows: A number of poets sit on the banks of a little stream that flows through Jonangu shrine. They all have to compose a tanka – a poem of exactly 31 syllables – on a predefined topic, in a predefined amount of time. How long they have is determined by the stream and the sake: Little sake cups are released upstream and when they reach the last person, the poets must be finished, and then all the poems are read aloud. 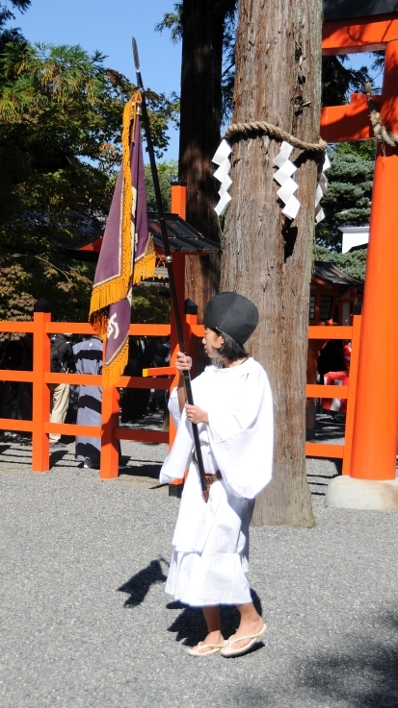 I arrived at the shrine – after a trip of 90 minutes, and I hadn’t even left Kyoto just yet – about one hour before the event started. The shrine is very large and has two beautiful gardens with stones and trees and big koi ponds and streams in between. It seems that the cherry blossoms are famous there, but even now the gardens are a beautiful sight. When I arrived at the appropriate part of the garden, I was surprised to see that benches had been set up for the spectators, not just for the honorable paying guests, but for all of us. Never before did that happen, maybe the event was just the right size for this to be feasible. The main event – I’m still undecided whether to call it a ceremony, a game, a competition… – started at one o’clock with all the participants, all dressed beautifully in elaborate Heian-style costumes, entering the garden from the main shrine building: First a few attendants from the shrine, then traditional musicians and a dancer, then the seven poets who would take part in the game, and two children who carried long bamboo sticks and were charged with an important role during the game. I’ll get to that in a moment. 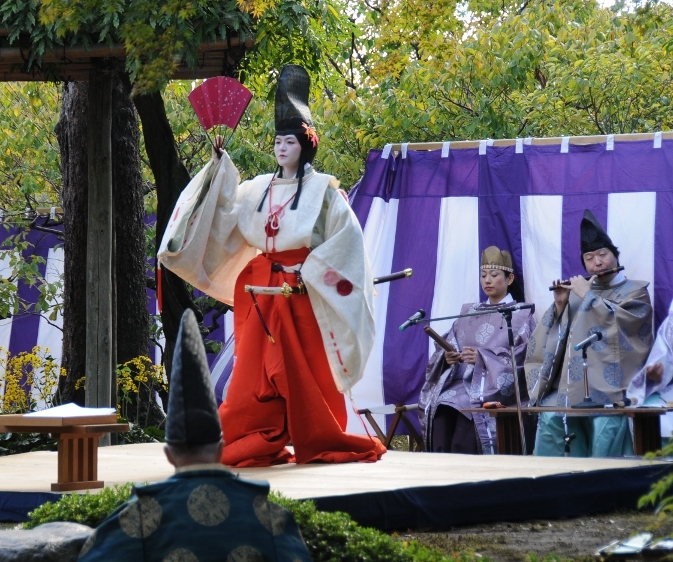 First, there was some traditional Heian-era court music, thankfully short, and a dancer gave a performance, with traditionally prescribed movements, all executed very precisely, and certainly with a lot of meaning behind each gesture, decipherable only for the initiated. Then, the seven poets were shown a scroll – I assume that the topic of the poem they had to compose was written on it – and then they took their places along the little stream. On each place there had been prepared a little cushion and a tiny table with writing utensils: ink, brush, and paper. When they were settled and ready to write, the first cup of sake was released upstream. The cups were mounted on little duck-shaped boats and, as the stream was rather rapidly flowing, they picked up quite some speed. Probably because of that, there was not a single sake-duck released, but quite a number of them, although I could not count them from my vantage point. I did notice, however, that, although the stream was comparatively broad, that sometimes the little ducks would get stuck, and this is where the two children came in. With their long bamboo poles they were supposed to help the sake on its way, and they did so by wandering around the stream and the poets with earnest faces and a grave manner. When the last sake duck had reached the last poet, all poems were collected. A group of five men dressed like priests would sit down on the platform where the dancer had given her performance before, and then would read each poem. First, the name of the writer was announced (and probably also the poetry school he came from, but I am guessing here) and then the poem was read once by one person, and then by all of them, both times in a kind of chant, as I have seen before at religious ceremonies. Obviously the topic had been somehow related to autumn, I could make out words like trees, colours, leaves, autumn, momiji… During the reading, more sake was sent down the stream, and this time I could see some of the poets drinking a cup or two. Howver, most of the sake was probably imbibed by the koi in the next pond… Anyway, after all the poems were read, the poets, dancers, and musicians left the garden. I thought there would be an announcement of a winner, a best poem nominated, but I was told that was not the purpose of the meeting. I know, however, that in the Genji Monogatari (*), where this game was already mentioned, there was always talk about people writing good and bad poems, so I think that in the olden days, there was probably lots of judgement going on… After the poets had left, there was a purification ceremony at the same little stream. People were invited to buy a little piece of paper in the shape of a man or woman, handle it in a prescribed way and then release it into the stream, to the incantations of a priest. Again, the two children were there and gently used their bamboo sticks to guide the prayers and wishes on their way. (*) The Genji Monogatari, the Tale of Genji, is one of the oldest Japanese novels, written in the 11th century by a lady in waiting on the Heian court. Apparently, the game had already taken place then in the same shrine as now. 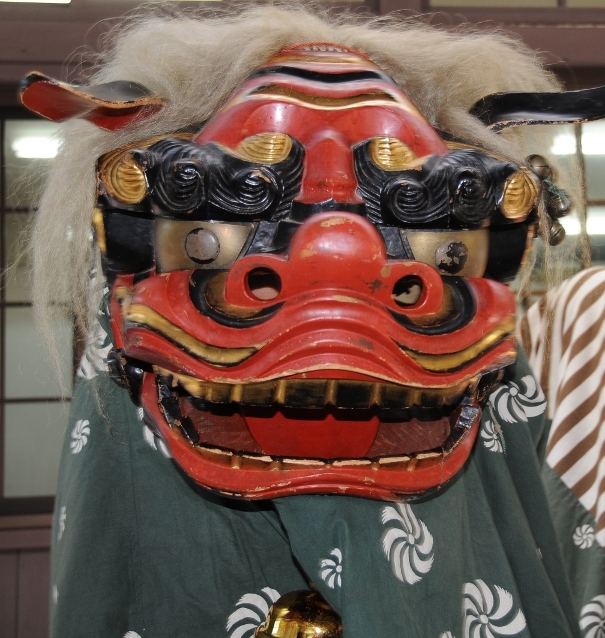 Yesterday was the matsuri of Yoshida shrine, which I consider “my” shrine, as it is less than 5 minutes away from Ebisu’s. 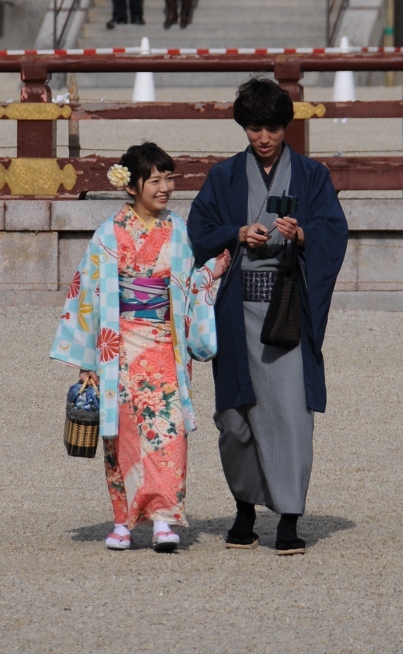 It was a matsuri as many others I have seen before, but on a much smaller scale, it felt almost intimate. As I got the timing wrong, I was very early and could see the preparations. 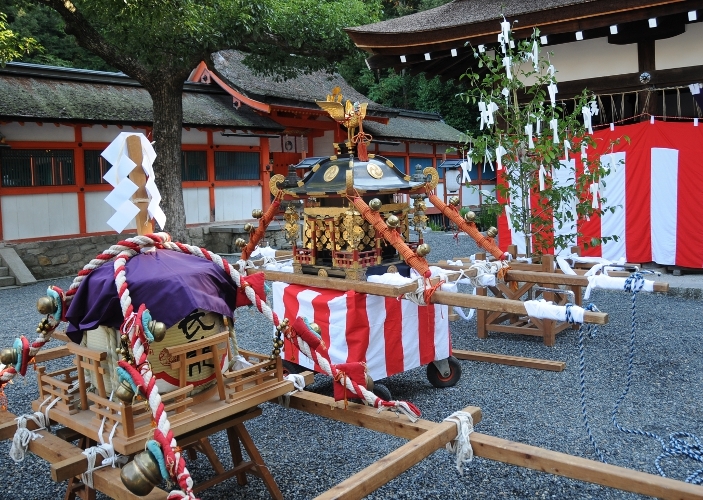 Some things were ready: The main mikoshi had been prepared and the seats for the priests, the musicians, and the local dignitaries who would be present during the religious ceremony. The three carts that would be carried or drawn through the streets: a large cask of sake, a small mikoshi, and some sort of sacred tree, decorated with paper. Others were still in the making: Four Taiko drums were set up at the main square of the shrine and carefully covered to shield the skins from the sun before the performance. 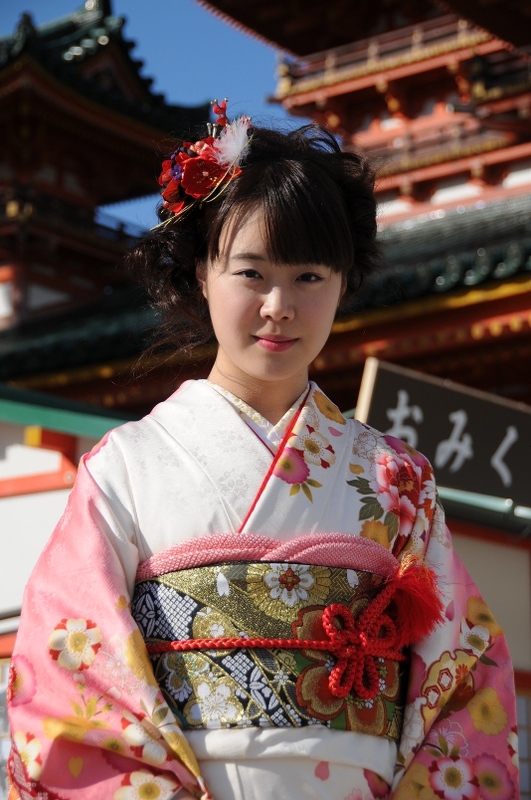 People who would be participating in some way or the other, would get dressed: the dignitaries mentioned above, the students, both male and female, who had the honor to carry the mikoshi through the streets, the children who would accompany the parade. The two students who would play the important role of the lion got into their costume – and into their role. I could ask them a few questions, they were highschool students and it was not their first time. The lion – shishi – who accompanies the parade is performing a lion dance – shishimai – and part of that dance is to chase and bite little children, in order to bring them luck in the next year. Apparently their parents like that idea better than the kids though… Finally, the preparations were over, and as a sign that something would start happening, the musicians took their seats. 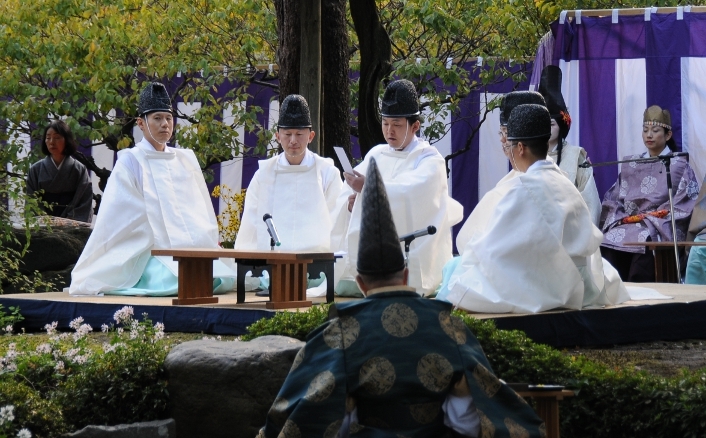 Then, the dignitaries formed a lane through which the priests – five of various ranks, distinguishable by their robes – would walk toward their seats in front of the musicians, then the dignitaries – all dressed in black ceremonial kimono with gray hakama – would take their own seats opposite the priests. 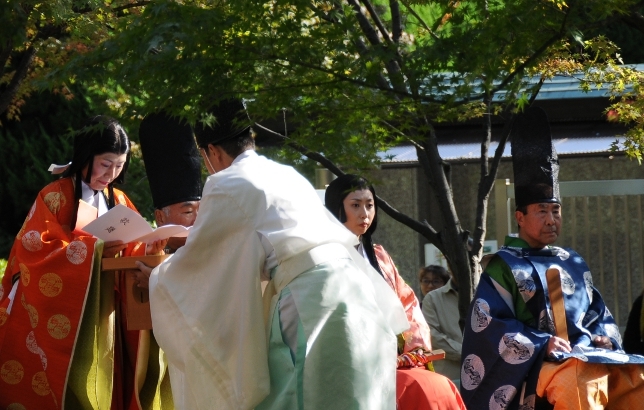 The ceremony started with the usual bowing and consecration rituals. Then the priests got up and went to a small shrine, and, while the musicians played a tune – well, a single tone, actually, that sounded both creepy and hallowed – they transferred the kami of that shrine into a little portable shrine, and from there to the large mikoshi that had been prepared. 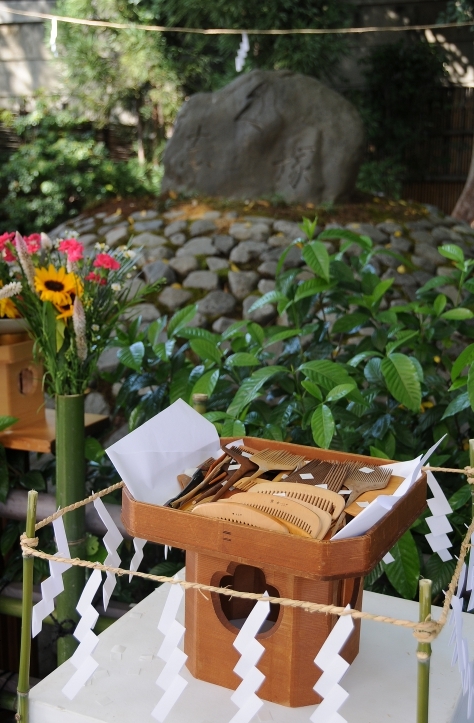 Then, more bowing followed, and each of the dignitaries made a small offering to the kami in front of the mikoshi. When that ceremony was over, the people gathered for the parade. Under the drumming of the taiko the parade started out from the main shrine, uphill past four other, smaller shrines (I am never sure whether they have anything to do with Yoshida shrine or not) and then, the parade meandered through the neighborhood, with a drum upfront, the two mikoshi behind – carried by a large group of girls under many washoi-screams – and the lion doing his dance to scare, I mean, bless the children. It was a great autumn day today, 30 degrees, sunny, with a clear blue sky… I celebrated by going to a quite unique festival in Yasui-konpiru-gu shrine: The comb festival or kushi matsuri. Similar to the needle festival I visited last year, here people bring their old combs and hair ornaments to the shrine where a ceremony is held for them. Apparently the idea behind these ceremonies is, that when an object has been used for a long time, they possess spirit – imbued by their owner’s or their own – and it is thus proper to send those spirits back to the gods instead of just tossing the item. Such ceremonies are held in various shrines and temples for a number of things: needles, combs, calligraphy brushes, dolls,… Unfortunately, I could not find out what would happen to the combs and hair ornaments that were brought to the shrine, but the thing in the back of the image below is called the kushi zuka, the comb mound, so maybe they are interred there, or at least, at some former time may have been. Just like last year, there was first a ceremony and afterwards a short dance performance called “black hair dance” as an offering to the gods. 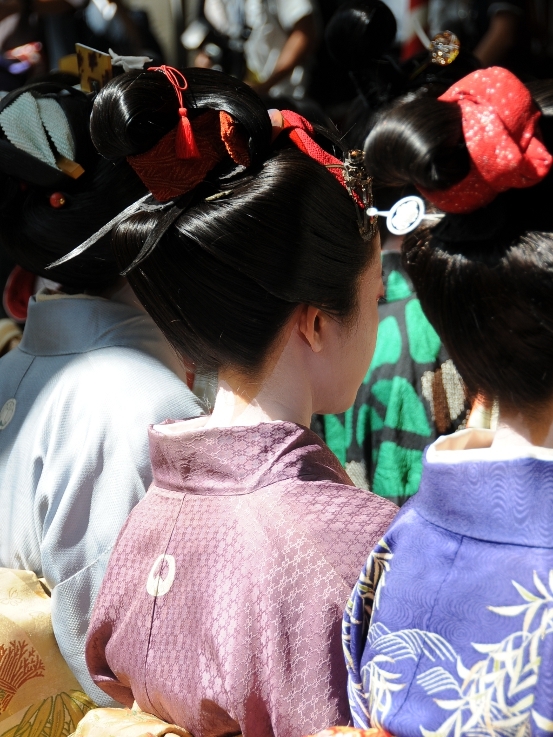 The special thing about this ceremony at this shrine, however, is the attendance of about 50 young girls sporting the hairstyle of various periods in Japanese history. 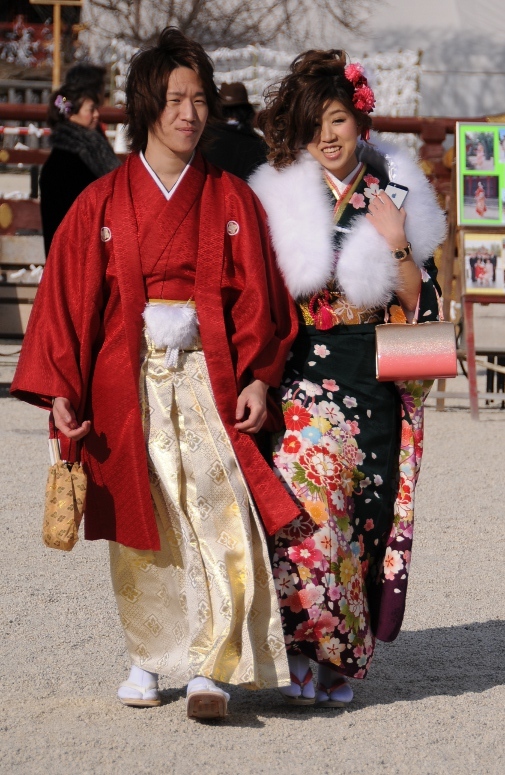 Of course, they wore beautiful kimono of the appropriate time as well, but the show piece were clearly the various coiffures. 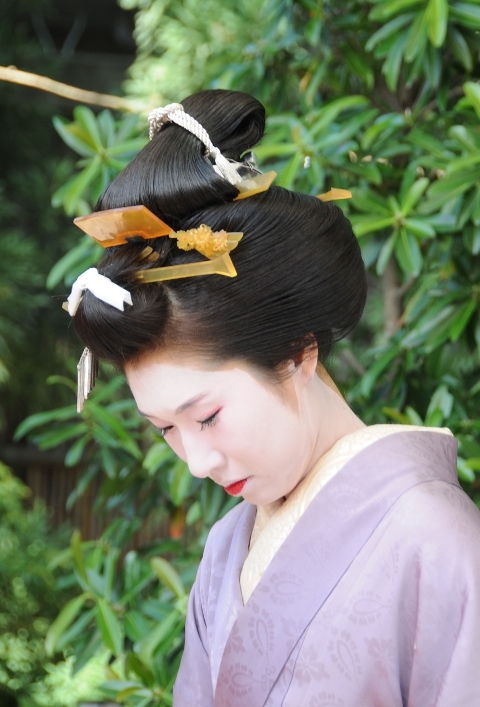 I asked one of the girls in an elaborate Edo period hairstyle whether this was all her own hair. 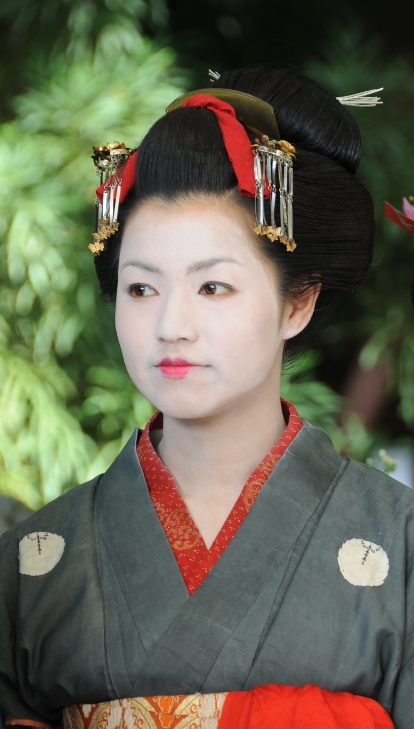 In case you consider me rude: Geisha very often have rather short hair and wear wigs for their performances, so I was curious. 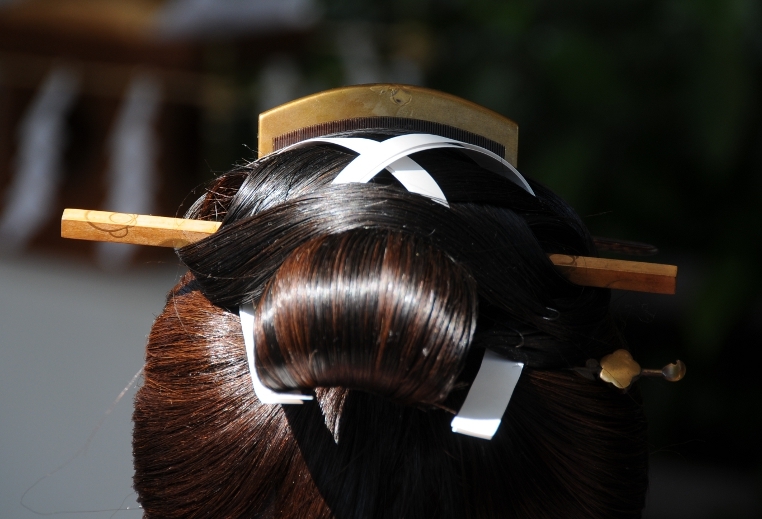 She said her hairstyle was about half-half, that some of the longer parts were hair pieces, made in the way they had been produced in the Edo period. It was very well done, and practically impossible to distinguish the pieces from her real hair, but, taking a closer look, especially from behind, you could see for example pieces of black paper that were used to style the hair. She also said that finishing her hairstyle would take about 3-4 hours – she must have gotten up very early this morning! After the ceremony and the dance, the girls formed a long procession through Gion, but I did not go with them, I had had plenty of photo-opportunities in the shrine already. Yesterday, I was woken up by the neighbours just before 8 am. They were already up and about on the little street down the steps from our house and chatting and laughing and doing something. Children were also already up and running about – what ever happened to sleeping in in the weekends? 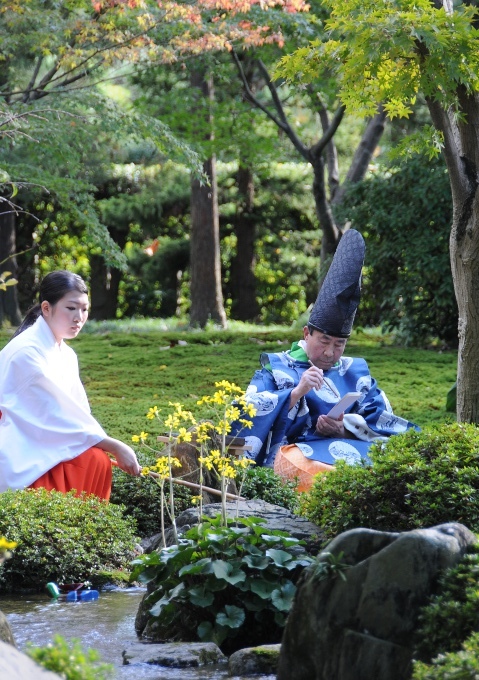 There was something going on all day, and in the early afternoon, the party culminated in a little ceremony at the Jizo shrine at the bottom of the steps… This I found worthy of investigation, and, lo and behold, last weekend was Jizo-Bon, the Jizo festival. Jizo is a Buddhist saint, a Bodhisattva (Japanese: Bosatsu), that means, he has attained enlightenment, but will stay on Earth to save other souls. 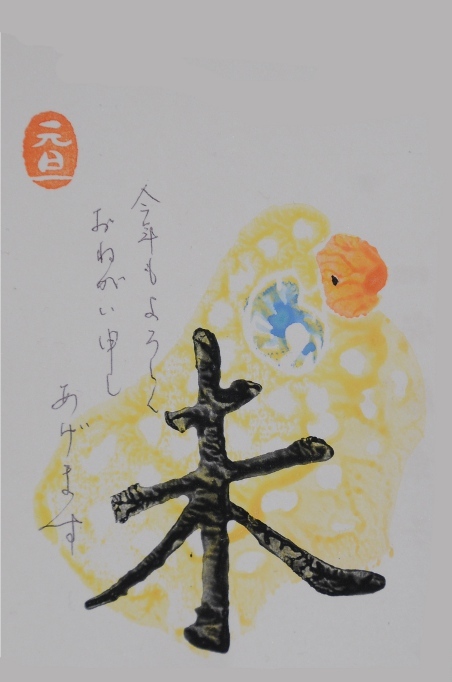 O-Jizo sama is chiefly the guardian of children, dead or alive, but he also takes care of travellers and firefighters. Thus, he is probably the most popular saint in Japan and his statues can be found everywhere. Often he is depicted as a simple Buddhist monk walking with a staff, and the statues are clothed in little red or white hats or bibs. The idea behind that is that, as Jizo will take care of dead children, he will protect them from harm and cold – and pass on the clothing. 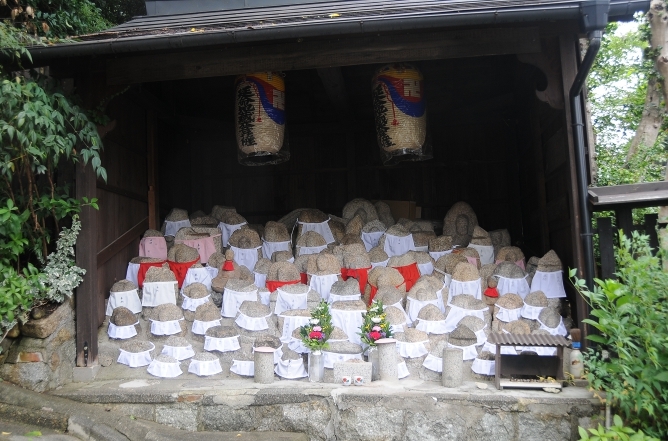 Jizo-Bon is the yearly festival for this saint, and it happens on August 24th (and sometimes also on August 23rd). Traditionally, it has been a day to confess bad deeds to the Jizo and asking for their forgiveness, and probably many people still do that. 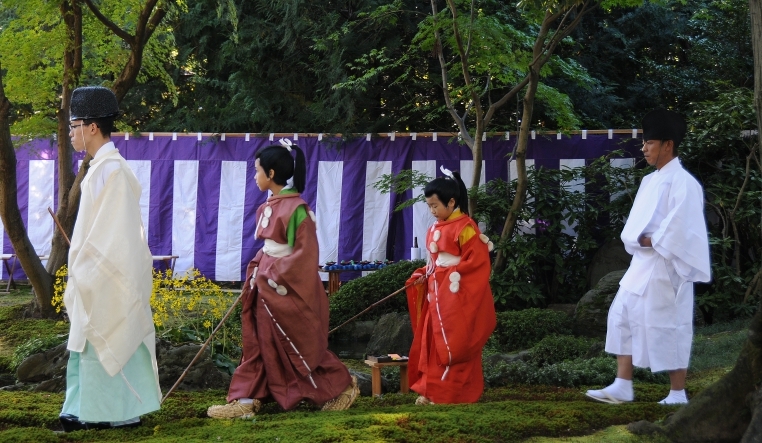 Nowadays, it is often combined with a children’s festival, Jizo-sai, where the neighborhood children are allowed to do little things like changing the clothing of the Jizo statues or painting their faces, and eat red-coloured food. From the sound of it, it seems that the kids had lots of fun last Sunday! Note: I will visit a friend in Nagoya for the rest of the week, so my next post will be in September! Indeed, the Daimonji festival took place on Saturday evening, despite all the rain. A friend of mine told me that it was a religious ceremony, nothing geared towards tourists, so they would try to do it at the designated day no matter what. It rained heavily on Saturday, with brief stops in between, and all day I was unsure whether the daimonji would take place. However, the rain stopped at around 6 pm, and when it got dark about an hour later, you could make out people – or rather, their flashlights – on Mt. 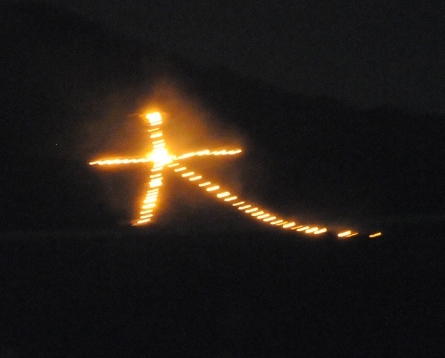 Daimonji, where the largest and the first of the five fires is lit. I went to a friend of mine who lives farther North in Kyoto and who had arranged to go to the roof of a three storey building in his neighborhood. From there, four of the five fires could be seen, although not all picture perfect: the hidari-dai or “left dai” fire could not be seen in its full glory, but only as a single thin strip of fires. 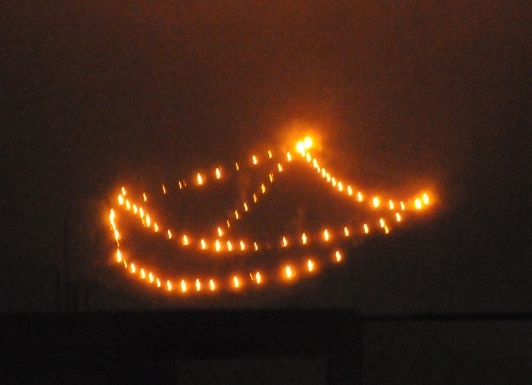 Here are photos of the three fires – from right to left on the mountains, in order of their being lit – that are more or less recognisable: The dai on Mt. Daimonji, which simply means “big”; the two signs myo-ho, part of a Buddhist sutra; and my favourite one, the fune, the boat-shaped fire. Watching the fires being lit one after the other to guide home the ancestral spirits was once again a wonderful, touching experience. The whole display only took about half an hour, and then I walked home, meandering through town in the dry, cool evening. There is only one of the daimonji fires I have not seen yet: the big torii gate on Arashiyama. Maybe I will try to go there next year. 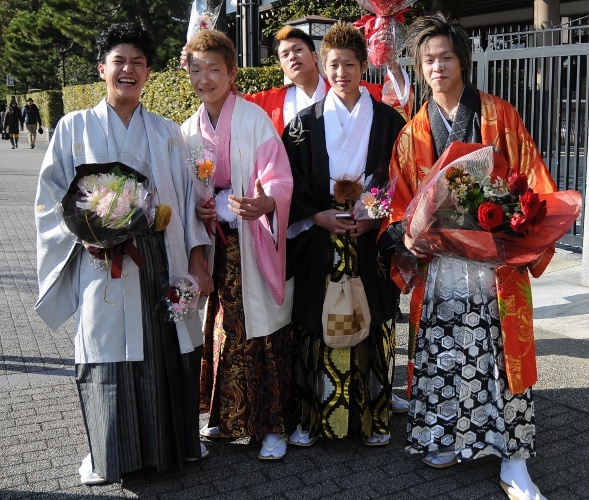 Today was a holiday, the seijin-no-hi, Coming of Age Day. In Japan, you become a legal adult at the age of 20, and seijin-no-hi celebrates all the young people who turned 20 in the last year. That this is a special day can even be deduced from the language: 20 years old is irregularly named hatachi instead of nijusai as would be normal. 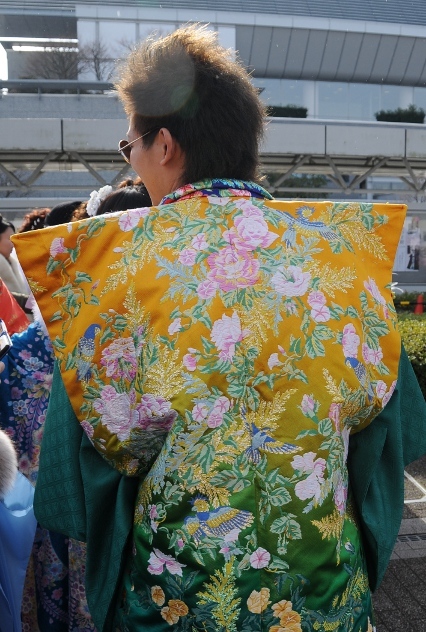 All over Japan, there are official celebrations at government offices, and groups of youngsters dressed up in their best finery (i.e., kimono with sleeves to the ground for the girls and hakama and haori for the guys) can be spotted everywhere all day long. The young people are obviously having a blast, and the atmosphere is lighthearted, joyous, and festive, despite the low temperatures. The nice thing is, that they are all happy to have their pictures taken, and both Japanese and foreigners seek out the best places for a photo opportunity. 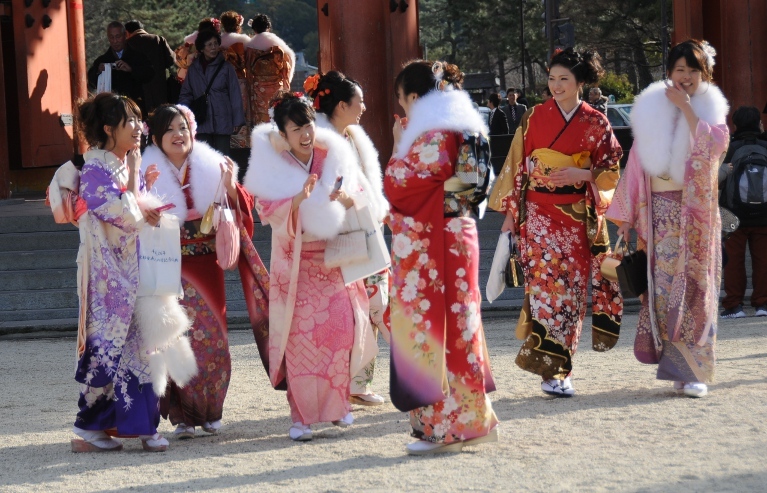 In Japan, the New Year is the most important holiday. It is celebrated with efforts the West reserves for Christmas. 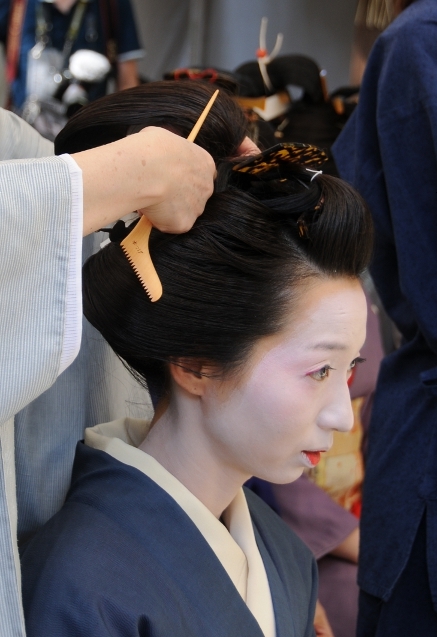 There are lots of routines, rituals, and traditions surrounding New Year’s in Japan, so I will focus on the two things I did myself this time. Like in Austria, where the large bell of the Stephansdom in Vienna rings in the New Year, temple bells play an important role in Japanese New Year’s Eve. In a ceremony called joya-no-kane, Buddhist temples all over the country ring their large bronze bells. 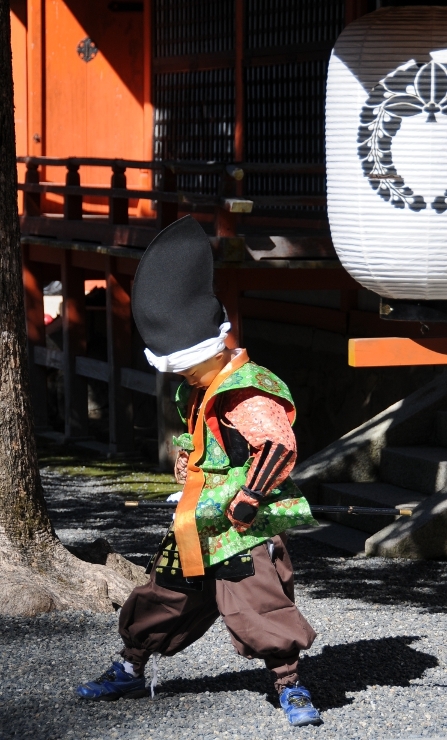 It depends on the temple how formally this is done; for example in Kyoto’s Chion-in, one of the most famous spots for the ceremony, the bell is rung exclusively by the monks of the temple, whereas in many smaller temples, even normal people can ring the bell. 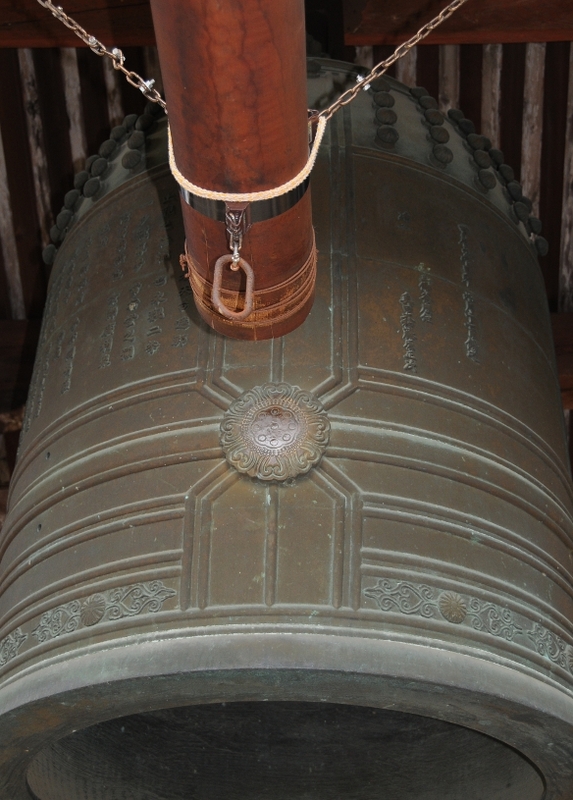 In any case, the bell is struck 108 times at New Year’s Eve – once for each of man’s earthly desires which, according to Buddhism, cause suffering. Each time the bell is rung, one desire is eliminated from those who listen, so they can start the New Year with a clean slate. A Buddhist temple bell is a huge affair, the one in Chion in being 3.3 metres high, 2,7 metres in diameter, and 70 tons heavy. It is rung – or rather, struck – from the outside with a large wood beam, and it takes 17 people to do so. The sound of such a temple bell is very loud and deep, it carries a long way and when you are close enough, it resonates deep within your body. Only when the tone has completely stopped, the bell is struck again – so, the larger the bell, the longer the joya-no-kane will take. The starting time depends on the temple. 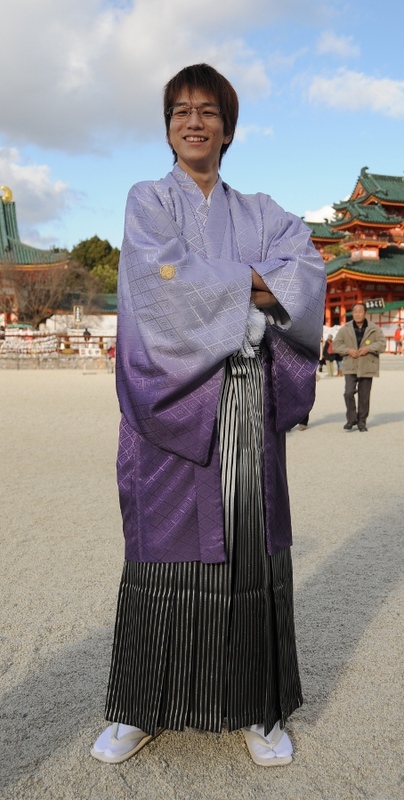 In Chion-in it is timed so that the 108th strike happens in the New Year. Other temples have different rules. This time, I could year temple bells from around 11 pm to 1:30 am approximately.